Pathogen: caused by the fungus Cercospora sp. This is a common disease of Ligustrum species. There are two Cercospora species which cause this leaf spot disease. 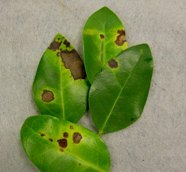 A related species, Pseudocercospora causes similar spots. Pathogen cycle: These fungi survive adverse conditions in leaves in the canopy and in fallen leaves. The spores they produce are wind blown or carried in splashing water to infect new leaves. Management: Remove fallen leaves from beneath the plants. Avoid overhead irrigation, or water in the early morning hours so that the foliage dries before nightfall. Cercospora spp. can be difficult to manage because they do not always respond to some of the more commonly used fungicides. Two products that seem to work well against Cercospora diseases are SYSTHANE (myclobutanil) and HERITAGE (azoxystrobin). Other fungicides that also are labeled for these diseases include MEDALLION and those that contain the active ingredients propiconazole (BANNER, SAVVI, SPECTATOR, etc. ), thiophanate-methyl (OHP 6672, 3336, FUNGO, T-STORM, SYSTEC-1998, etc. ), mancozeb (DITHANE, FORE, PENTATHLON, PROTECT, etc. ), and chlorothalonil (DACONIL, CLOROSTAR, ECHO, etc.). Do not use chlorothalonil products on pittosporum. Likewise, the combination products ZYBAN (mancozeb + thiophanate-methyl, MANHANDLE (myclobutanil + mancozeb), and SPECTRO 90 (thiophanate-methyl + chlorothalonil) also should be effective. All of these fungicides should be applied preventatively--i.e., before symptoms occur to be most effective. They will not cure established infections but will protect healthy foliage from becoming infected. Fungicides for use in home gardens include thiophanate‑methyl products (e.g. CLEARY 3336) mancozeb products (e.g. DITHANE)and chlorothalonil products(e.g. DACONIL).